Tim of P’Grove of the Shenandoah offering at main rite, 2009. This years rituials will honor the many aspects of the Earth Mother. The main ritual will also will plant another tree in the orchard at Thor’s Hollow. There will be a receptacle for offerings to be placed. Works you have created, artwork, jewelry, etc. Anything sustainable such as biodegradable offerings, seeds to share with the folk, etc. Q: Can I make an oath at the rituals? A: We would prefer oaths not be made at these rituals without talking to the chief liturgists for those rituals first. 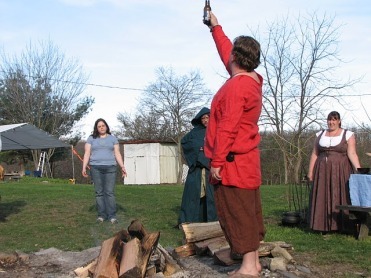 Since oaths are sewn into the wyrd of the participants, any oaths that are not full-filled could reflect on the community as a whole. Q: Can I make an offering during the ritual? A: Yes, during the main ritual when the time comes for praise offerings, you may come up and make your offering to the fire, well, or tree. Please avoid long speeches to help hasten the pace of the ritual. Q: Do I need to wear ritual garb/gear? Q: Can I take pictures during ritual? A: Yes, pictures are allowed during ritual, however we would ask that you let the Chief Liturgist know so they can designate a portion of the ritual “circle” for those that do not wish to have their picture taken. It is also common courtesy that you do not post pictures on the internet without their permission, nor tag anyone in pictures on Facebook without their permission. Q: Can I sit in a chair during ritual? A: Yes, there is no requirement to stand or kneel during ritual. We may process into the ritual space, but you are welcome to sit at any time, especially if you have a health issue that prevents standing for long periods of time. Q: Are children allowed to attend the rituals? A: Yes, children are always welcome. As a courtesy, any loud children should be temporarily removed from the ritual space until they are calmed down, and children should not be allowed to roam around the fire unattended during the ritual. But Trillium is a very children-friendly event.